Keep the munchies at bay with these healthy and tasty treats that are high in protein. Try premium protein flapjacks, protein muffins and protein coffee when you crave a snack between meals and how about premium protein pancakes or protein porridge for the perfect healthy breakfast. Where do I use my Bodybuilding Warehouse voucher code? Choose a code, copy it and click through to the Bodybuilding Warehouse website. Search or browse for your products and add them to your cart. When you're finished go to your shopping cart and click checkout. To enter a code you’ll need to log-in or register for a Bodybuilding Warehouse account. Log-in to your account and on the basket page, you’ll be able to enter your discount in the box underneath the order summary on the left. Click ‘Proceed to Checkout’ to continue with your discounted order. Achieving your bodybuilding goals is about the right balance of diet and exercise, to help you reach those goals faster there is a great range of bodybuilding supplements available in the UK. Whether you are looking for pre-workout supplements, post-workout supplements, mass gain supplements, endurance supplements or fat burners, you are bound to find just what you want here. Even if you are a complete novice to bodybuilding you’ll find a helpful supplements for beginners range, with each item having a detailed description of what the supplement can help you achieve, how often to take and its ingredients and nutritional information. 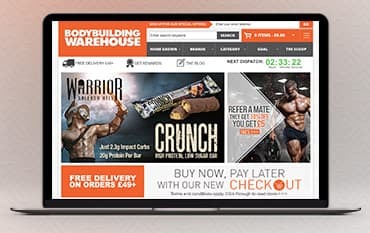 Get all your protein, weight supplements and gym clothing for less with the help of a Bodybuilding Warehouse discount code. Simply choose a code listed here at NetVoucherCodes that best suits your order and enter it in the relevant box on the Bodybuilding Warehouse website, upon checkout. This will then give you an instant saving on your online order. Once you find a great code, be sure to take advantage of it as soon as possible, codes tend to be time sensitive, so be sure you don’t miss out. You will also need to check any terms and conditions associated with each code and ensure your order meets these, to avoid disappointment at checkout. Nobody said that you can’t look good while you train and with the range of clothing and accessories on offer at Bodybuilding Warehouse you’ll certainly look the part. With caps, vests, t-shirts, hoodies and more on offer, you’ll be kitted out in no time. In addition to the bodybuilding clothing, you’ll find a great range of accessories to use both in and out of the gym, with a huge choice of shakers, water bottles, and water jugs at great prices too. Whatever you need to get started with your workouts, Bodybuilding warehouse is sure to have the perfect item. Delivery is £4.99 or free on orders over £49. You have 7 days to return your order to Bodybuilding Warehouse if you no longer want it. Or use the enquiry form here. Founded in late 2008, Bodybuilding Warehouse is now one of the leading bodybuilding supplements websites and manufacturers in the UK. They have one of the very best, state of the art, sports nutrition factories in Europe and were one of the first UK companies to offer the new American supplements On the website you will find an extensive range of bodybuilding supplements that are affordable but are top quality. Their supplements come in a range of unique flavours not just standard chocolate, strawberry and vanilla flavours. You can enjoy flavours such as cinnamon caramel swirl, coconut, brandy snap, banana peanut butter and more. Shop here for everything from the best value high-quality whey protein concentrate, to the latest US pre-workout supplements. Grab a Bodybuilding Warehouse discount code and save on your next supplement order, delivery is fast and free with a minimum spend.